How gorgeous is this cover?! I have to admit that I've not watched the movie (gasp!) and haven't read the story yet either (double gasp! ), however I'm fascinated by this image. There's so much to marvel at, from the slightly off-kilter aspect of the ground to the button-shaped moon to the incredibly sinister tree. And the color extremes, from bright white to dark blue, have my eyes roving all over the place and into each corner. Not having a great grasp on what the story is about, the cover alone has me intrigued! When Coraline explores her new home, she steps through a door and into another house just like her own... except that it's different. 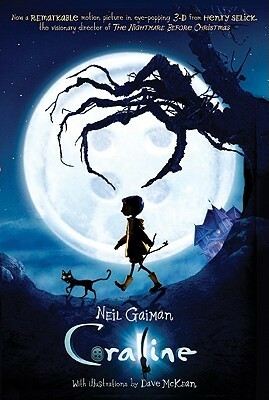 It's a marvelous adventure until Coraline discovers that there's also another mother and another father in the house. They want Coraline to stay with them and be their little girl. They want to keep her forever!